The world as we know it has ended, mysterious forces having brought down civilization. Gabriel (Shia LaBeouf) walks the earth in search of his family, fighting through desperate hardships. As he travels, we flash back through the events that brought him to such dire straits. 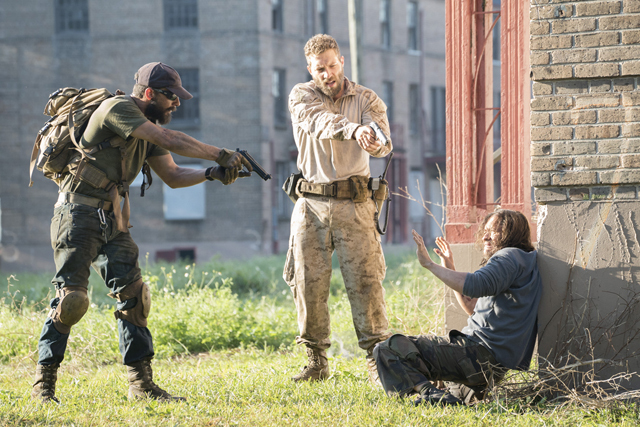 He had everything, a wife and son, his best friend Devin (Jai Courtney), and a life purpose in the Marines. Now he has only Devin by his side as he seeks to be reunited with his family in a barren wasteland. War is hell and life is fragile. I had looked forward to Man Down because I wanted to see Shia LaBeouf’s take on the wounded warrior, and the festival description of a man fighting through his troubled psyche was intriguing. But Shia apparently thinks that Dramatic Acting means mumbling into your beard and spitting just absolutely everywhere (that is not an exaggeration). The directing, the acting, it was just so..average. Jai Courtney did fine with his part, the bro-y solider buddy best friend Devin, but he didn’t really bring anything personal to the role. I honestly felt the worst for Gary Oldman – his role as Gabriel’s military counsellor was small but well acted and earnest. Kate Mara was wasted as well, working with grace through scenes that didn’t give her much. Her character is woefully two-dimensional. I did love the score though. Composer Clint Mansell has worked on a number of fantastic projects (he worked on High-Rise as well), and I added steady and quiet drama to world which Gabriel inhabits. Gabriel isn’t really in a post-apocalyptic wasteland. You see, the traumas of war and the betrayal of his wife and friend whole he was away have made him crazy. It’s all a delusion, he sees the world as a terrifying place from which he must save his family from the enemy, with Devin as his only ally. But Devin is dead as the result of Gabriel’s mistake in battle, a phantom of his imagination as Gabriel is suffering a complete psychotic break. Apparently writer Adam Simon thinks that PTSD automatically makes you hallucinate and develop multiple personality disorder. As the daughter of a veteran and someone well aware of the actual crisis of ignored or misunderstood PTSD among service-members, this is incredibly offensive. Finally, the secret itself was (I feel) painfully obvious pretty early on, but Montiel insists on beating us over the head with extended flashbacks and even a ghost fade-out to really drive home that Devin was dead aaaaaall along. Even the title Man Down is used as a bludgeon, awkwardly and nonsensically used to represent a father’s love for his son. I’m not going to pretend that this film won’t have an audience though, that it’s completely unwatchable – the quiet sobbing all around me during the credits suggested that more than a few people were affected by the story.But for me my disappointment quickly grew into disbelief, and I was shaking my head all the way out of the theatre.